The influence of this historic journey could be witnessed in all subsequent activities of India’s first prime minister. 85 years ago, Jawaharlal Nehru embarked on his first ever visit to Moscow to take part in the celebrations of the 10th anniversary of the October Revolution, that exerted enormous influence on the evolution of his world view. Nehru along with his father, wife and sister, while returning to India from their Europe tour travelled to Moscow on the invitation of the Soviet Society for Cultural Relations with foreign countries. 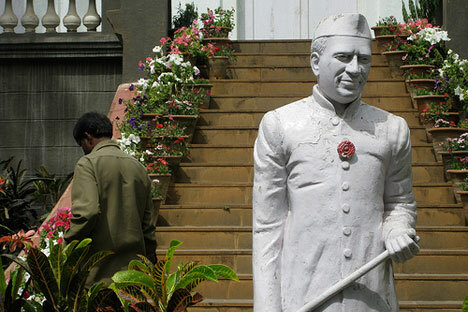 The four-day visit made a lasting impression on Nehru and influenced his world view very strongly. The influence of this historic journey could be witnessed in all subsequent activities of Pandit Nehru. Invitations were also sent to prominent political leaders and public figures and leaders of India’s freedom movement to take part in the 10th anniversary celebrations of the Bolshevik Revolution. The Soviet national daily Pravda in an article on November 5, 1927 reported about invitations sent to Indian democrats and a bitter reaction of British colonial authorities to this. The British colonial administration deliberately leaked these invitations in the press in order to create a sensation. But as some of the invitees expressed their strong desire to avail of these invitations, the British authorities refused to grant them permission to go for the celebrations. In spite of the prohibitory orders of the British authorities, some Indians, besides Jawaharlal Nehru and his father Motilal Nehru managed to travel to Moscow There was Indian revolutionary Saklatwala along with three members of the anti-imperialist league, who had arrived in Moscow to participate in the celebrations linked to the tenth anniversary of the October Revolution, and according to Nehru’s own account, Saklatwala was present in the Moscow station to greet him. The Soviet media provided lot of coverage to the visit of Motilal and Jawaharlal Nehru. The newspapers describing them as most prominent leaders of India’s freedom movement, gave an account of the activities of Jawaharlal Nehru in the capacity of an official representative of Indian National Congress at the first conference of the Anti-Imperialist League, held at Brussels in 1927. Nehru was received in the Kremlin by Mikhail Kalinin, Chairman of the Central Executive Committee of the USSR, a position equivalent to President. The future prime minister of India attended the Moscow court proceedings, visited factories and went to museum of the October Revolution, Bolshoi theatre and saw a famous Soviet producer’s film ‘The End of Saint-Petersburg.’ On November 8, Nehru took part in a ceremonial meeting dedicated to the tenth anniversary of the October Revolution. Nehru and his father were given a standing ovation when they were introduced to the audience. Nehru also met famous German revolutionary Clara Zetkin, Sun Yat-Sen’s widow Soong Chingling and eminent Mexican writer Diego Rivera in Moscow and had scores of meetings with Soviet workers and peasants . Shortly after his arrival in India, Nehru published his impressions in a booklet called “Soviet Russia” that provided vivid accounts of Soviet socio-economic transformations. Writing about the historical significance of October revolution and the Soviet socio-economic transformations , Nehru noted ,” The October revolution was undoubtedly one of the great events of world history , the greatest since the first French revolution , and its story is more absorbing from human and dramatic point of view , than any tale or phantacy .’ Hi s enthusiasm for Soviet project is clear from the passage where he writes,” it is difficult to feel indifferent towards Russia, and it is more difficult to judge her achievements and her failures impartially .’ He further said that entire world is watching Soviet Russia , some with fear and hatred and others with passionate hope and the desire to follow her path. Nehru visited Soviet Russia at a time when it was internationally isolated and to make matters worse, a host of developed capitalist countries treated Russia as a pariah. Nehru stressed the need to develop friendly ties with the USSR. In his book Soviet Russia, he made an attempt to convince the Indian people to treat the Soviet Union as a friend. It seems as if Nehru could envision the steady growth of the Soviet economy and culture to extend help to India during this trip. His deep conviction that the Soviet experience could be useful for India in solving most of its socio-economic problems became an integral part of his policy as Independent India’s first Prime Minister. In his inaugural address to the annual congress of Indian National Congress in 1936, Nehru thundered that if the future is full of hope, it is largely because of Soviet Russia and what it stands for. The influence of Nehru’s Moscow visit on development of his world view and formation of his ideology was profound. After his visit to Moscow, he pleaded for complete independence for India which did not receive the stamp of approval of Mahatma Gandhi but facilitated the formation of a leftist group within the Congress Party. Besides the communists, it is Nehru who did the most to popularise socialism in India and thereby contributed to the formation of a definite leftwing inside the Congress Party. Learning about the repressions of Stalin regime, Nehru was disappointed and distanced himself from the so-called “real socialism.” But he never gave up his socialist vision. Even in the last major gathering of the Indian National Congress during his life time, held in Bhubaneswar in 1964, Nehru’s clarion call was to build a ‘socialist pattern of society’ in India. Of course, the three pillars of Nehru’s socialist vision were growth, equality and democracy, out of which the “real socialism” established in the USSR completely missed the third pillar while the remaining two were defective.